Added by admin on February 13, 2018. Prime Minister Theresa May has urged Northern Ireland’s parties to make one final push towards an agreement to restore devolved government. Irish prime minister Leo Varadkar said he was hopeful that a deal would be struck this week. They were speaking after a series of meetings with the parties in Northern Ireland. The DUP and Sinn Féin have said that a deal is possible following Monday’s talks. Sinn Féin President Mary Lou McDonald said the talks had reached “a decisive phase”. Mrs May said that “it was now at the point where it’s time for local elected representatives to find a way to work together”. She said she had “full and frank conversations with the main parties” and that while “some differences remain, I believe it is possible to see the basis of an agreement here”. Taoiseach (Irish prime minister) Leo Varadkar said he was hopeful that the two parties could “come to an agreement this week”. Asked why the DUP did not meet the Irish government at Stormont today a party source told the BBC they were focussing on internal Northern Ireland matters. The source added there were also logistical difficulties. “The soundings from Arlene Foster and Mary Lou McDonald were positive,” he added. Mrs Foster said her party wanted a deal that was “sustainable into the future”. SDLP leader Colum Eastwood called on the DUP and Sinn Féin to “stop messing about”. “We still don’t know the colour of this deal,” he said. Prior to arriving at Stormont, Mrs May visited Bombardier’s plant in Belfast. She met factory floor workers and was shown the capabilities of the multi-million pound plant which is the main production site for wings for the C-Series. Her visit came just over two weeks after Bombardier’s victory in a trade dispute with rival aerospace firm Boeing. The US International Trade Commission (ITC) overturned a decision to impose damaging tariffs on US imports of its C-Series aircraft, which would have placed jobs in the Belfast factory at risk. Several previous rounds of talks between the DUP and Sinn Féin have, so far, failed to break the political deadlock. Earlier, a DUP source told the BBC a deal “is not likely” on Monday. Mrs May last visited Northern Ireland in May when she toured the Balmoral Show ahead of a snap general election. Since then, she has struck a parliamentary deal with the DUP and has faced criticism for adopting a hands-off approach to the deadlock at Stormont. Among the issues that have divided the parties is Sinn Féin’s demand for an Irish language act. The Irish language act has been a major stumbling block, with DUP leader Arlene Foster promising previously that it wouldn’t happen on her watch. What I am led to believe is that there could possibly be a very strange, legislative fudge which would see the creation of three separate bills, one for the Irish language, one dealing with Ulster Scots and one for wider cultural issues. The suggestion is that these three bills would end up merging together as one act in an attempt to spare blushes on all sides. On marriage equality, I am not exactly sure how they are going to sort that one out, but one option that has been discussed is the possibility of bringing a private member’s bill on the issue or deferring responsibility to Westminster. 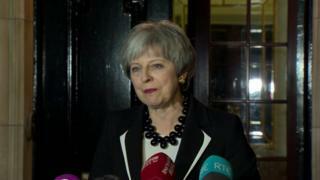 A Downing Street spokesman said the prime minister would remind the parties of the many pressing issues facing Northern Ireland and make clear her belief that a fully functioning executive is the best way to serve the interests of the whole community. “The (Irish) government has consistently said that the restoration of the institutions is essential in the context of full implementation of the Good Friday Agreement, and that it will continue to work very closely with the British government to support the northern parties to achieve this outcome,” he said. At the weekend, Sinn Féin’s vice president Michelle O’Neill predicted that the Stormont talks would conclude this week. Her comment strengthened speculation that a compromise between her party and the DUP could soon be unveiled.